If you understand French and are interested in learning other Romance languages, the MOOC Enseigner l’intercompréhension en langues romanes à un jeune public might be helpful. This MOOC, or CLOM in French, begins November 10, 2015, and lasts 4 weeks. It is designed for language teachers and students or anyone who is interested in multilingualism. The concept of intercomprehension refers to the ability of users of closely related languages to understand each other thanks to linguistic similarities. It appears that this particular MOOC will focus on the six main Romance languages of French, Italian, Spanish, Portuguese, Catalan and Romanian. Since it is developed by the Organisation Internationale de la Francophonie, the language used to teach about intercompréhension is French. You can sign up now to join the MOOC. This entry was posted in Learning French, Learning Other Languages, Learning Spanish and tagged language learning, multilingual, romance languages on October 6, 2015 by Dr. Jennifer Wagner. If you haven’t been using authentic videos with transcripts to learn languages, you are missing out on an effective way to increase your comprehension of spoken language as well as your knowledge of vocabulary and grammatical patterns. One website that offers many authentic videos and that I highly recommend is FluentU. 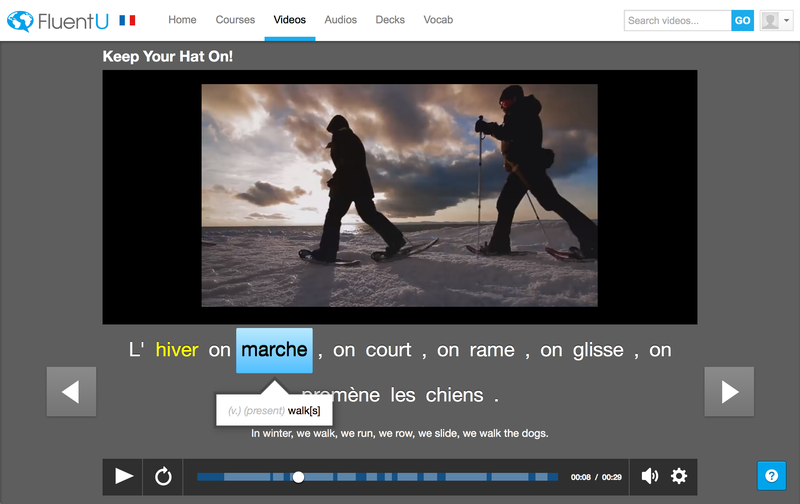 FluentU currently offers videos in French, Spanish, German, English, Chinese and Japanese, with Italian coming soon. As you can see in the screenshots, you can easily choose the difficulty level as well as the format of videos you are interested in: clips, movie trailers, commercials, etc. The transcript and translation appears below the video and hovering over a word also shows the translation of that word. FluentU recently released their iPad app if you are a mobile learner, with an Android app also in development. There is currently a free option if you’d like to create an account to check out the videos and captions. The Basic plan, which includes unlimited watching and listening with interactive captions, only costs $15 per month or $120 per year. The Plus plan costs $30 per month or $240 per year and also includes unlimited personalized learn mode, courses, flashcard sets and PDF printouts of the transcripts. Also note that you have access to ALL languages on FluentU rather than only one language so it is great for learners of multiple languages. You can change languages in Settings under Study Settings. This entry was posted in Learning French, Learning Other Languages, Learning Spanish and tagged fluentu, language learning, reviews, video on September 15, 2015 by Dr. Jennifer Wagner. An article on sociolinguistic competence (Dewaele, 2007) introduced me to research on language learners’ ideological beliefs and conflicts with the target culture that can hinder language acquisition. Dewaele provides two examples from Kinginger (2004) and Kinginger & Farrell’s (2005) research on Americans studying abroad in France which illustrate the importance of intercultural understanding and how adaptation to the target culture affects motivation in language learning. One student was annoyed that her French friend would not let her NOT have an opinion on politics and openly criticized the American government. She didn’t care much for politics and did not want to talk about it because she did not feel that it was an appropriate topic for discussion. Yet her friend would not let her change the subject. She consciously chose not to adapt to the French concept of “you must have an opinion” and decided to say nothing on the topic which created tension with her friend. Another student purposely resisted French gender patterns because she found it “ridiculous” that French women were “obsessed” with their looks. She expressed frustration at the sexism and harassment of women she saw on a daily basis which made her “hate to go outside.” She refused to conform to what she believed to be stereotypical French standards of what it means to be woman (i.e. overly concerned about appearance) and thought it perfectly acceptable to attend class in sweatpants or pajamas, as she often saw at her university in the US. Because of this, she made little effort to spend time with French speakers and spent most of her time abroad speaking English with other students or friends and family in the US via the internet. There have been many studies on the perception of sexism by American learners in study abroad contexts, especially in countries such as Russia or Japan. But the perceptions and ideologies of the learner needs to be understood in the context of how they help or hinder language acquisition for that individual. It is not enough to be motivated to learn a language – one must also be motivated to learn and experience the culture associated with the language. However, if cultural practices are considered undesirable by the learner, opportunities to use the language with native speakers will diminish as the learner resists or even rejects the target culture. This is perhaps why the rate of language acquisition for students doing study abroad varies so widely. In fact, Kinginger & Farrell maintain that “systematic research has yet to demonstrate universal effectiveness of study abroad for language learning.” Living in a country where the language is spoken is not enough. There are many, many factors to consider including gender, personality, level of language competence before study abroad, time spent using the native language, etc. de Nooy and Hanna (2003) also point out that “mere contact with other cultures may simply reinforce stereotypes and encourage hostility rather than fostering comprehension and mutual respect.” Spending time abroad in the target culture could (and unfortunately, does) cause learners to lose motivation and interest in learning the language if there are too many conflicts between the native and target cultures. Obviously, there will always be conflicts and differences between native and target cultures, but intercultural comprehension allows learners to occupy a third place between the native and target cultures with understanding and tolerance for both. Instead of judging the target culture based on how different (or better or worse) it is from the native culture, learners avoid falling back on their native culture to interpret the target culture and understand the value systems underlying the cultural differences between them. de Nooy, J., & Hanna, B. E. (2003). Cultural Information Gathering by Australian Students in France. Language and Intercultural Communication, 3(1), 64-80. Dewaele, J.-M. (2007). Diachronic and/or synchronic variation? The acquisition of sociolinguistic competence in L2 French. In D. Ayoun (Ed. ), Handbook of French Applied Linguistics (Vol. Language Learning & Language Teaching 16, pp. 208-236). Amsterdam: John Benjamins. Kinginger, C. 2004. “Alice doesn’t live here anymore: Foreign language learning and identity reconstruction”. In Negotiation of Identities in Multilingual Contexts, A. Pavlenko and A. Blackledge (eds. ), 219–42. Clevedon: Multilingual Matters. Kinginger, C. and Farrell Whitworth, K. 2005. “Gender and emotional investment in language learning during study abroad”. CALPER Working Papers Series 2, 1-12. The Pennsylvania State University,Center for Advanced Language Proficiency Education and Research. This entry was posted in Learning French, Learning Other Languages and tagged culture, language, language learning, motivation on July 8, 2013 by Dr. Jennifer Wagner. Readlang by Steve Ridout is a free site which helps you learn foreign languages by reading and translating words you don’t know. You simply import text from any website, click on words you don’t know in order to translate them into another language, and save these words so you can review them later. It uses a “spaced repetition flashcard system to make sure you remember the words” that you’ve clicked on and has a feature to open a dictionary in a side panel if you want to look up more information on the word(s). You can read the blog to see the latest updates, such as export word lists to Anki and translations of phrases rather than just individual words. Lately I’ve been using the transcripts from Podclub podcasts since I always prefer to have text plus audio. I imported the text of the latest episode of the Spanish podcast A mi aire, and I’m translating words into English. Readlang now lets you synchronize Youtube videos with transcriptions so you can listen and read at the same time. Finally, there is a Chrome extension called Web Reader that will translate any word you click on directly on the page rather than importing text into your account. You have no idea how long I’ve been waiting for someone to create this! Check out Readlang’s current features and send your feedback to Steve so he knows what new features to add. This entry was posted in Learning French, Learning Other Languages and tagged language learning, podclub, readlang on May 8, 2013 by Dr. Jennifer Wagner. There are a lot of free language apps available nowadays but many of them are not very good or extensive. They tend to include some basic words or tourist phrases in flashcard format, but very few offer connected text (such as stories) in addition to pronunciation. Lately I’ve been looking for apps that include both text and audio in foreign languages, and I’ve mostly found apps that provide one or the other, i.e. ebooks or audiobooks but not synced together so that you can read and listen at the same time. I have found a few apps designed for children, however, that mostly include fairy tales but some include original stories. Many have a “read to me” and autoplay option so you don’t have to keep swiping the screen. Luca Lashes : Original story available in English, French, Spanish, Chinese, and Italian. Hao-Ming Yeh /QLL Inc. : Apple version seems to only include English and Chinese but Android also has Spanish. Two languages can be displayed on screen instead of just one. Tri-Software : Lots of classic children’s books (in different apps) available in at least two languages. Most are available in English, German, French, Spanish and Italian and some even have Portuguese and Chinese. The free versions only include the beginning of the story. Readalong Spanish : Only in Spanish but you have the option of including the English text on the same screen. Vienom Kids Books : Two stories available in French & German and two stories available in French, German, and Spanish. Four different apps though, and the free versions only include seven pages of the stories. Any other useful (and free) apps to add to the list? I didn’t include any “free” apps that make you pay for every book. This entry was posted in Learning French, Learning Other Languages and tagged childrens books, childrens books apps, foreign languages, language learning, languages on April 13, 2013 by Dr. Jennifer Wagner.